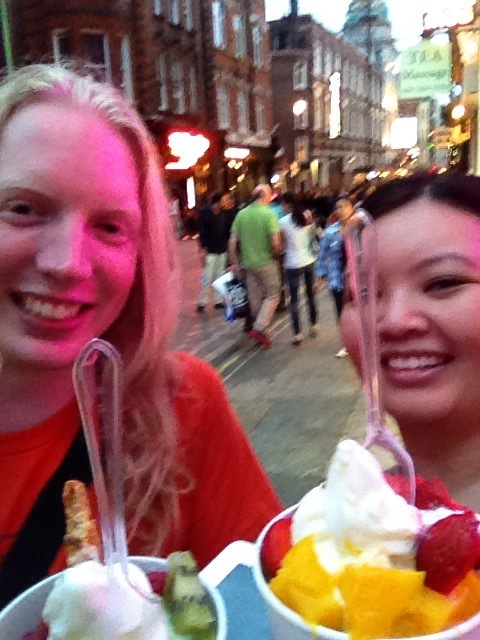 Last weekend I was in London, England, and made plans with Jezatron, GabrielVH, bethykins and fransgaard for little doll meet. However, my job comes with it’s own set of challenges and things can change in a split second – last Friday there were some very heavy thunderstorms over Toronto, most of Southern Ontario and New York @__@” and as a result I ended up being delayed a few hours. 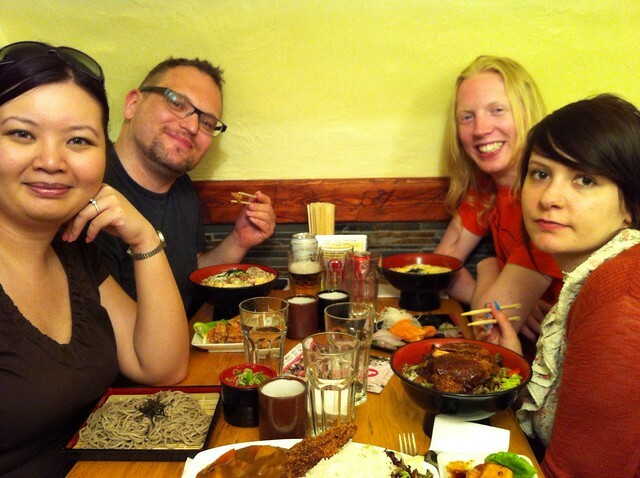 I was super late to meet up with everyone (sorry!!! 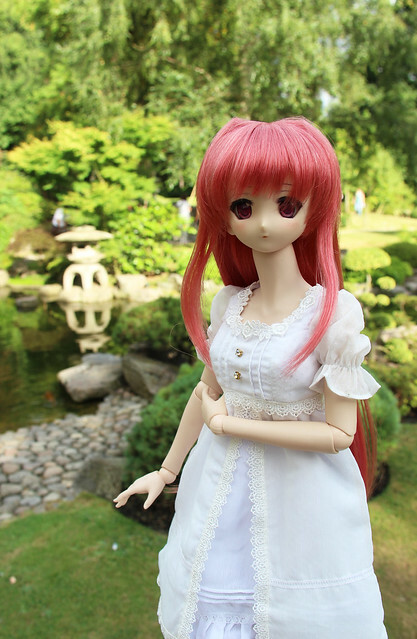 >__<“) but at least the weather in London cooperated and it was a perfect day. Rather than one of the big central parks in the city, we chose to meet up at the Kyoto Garden inside Holland Park and it was a beautiful place. 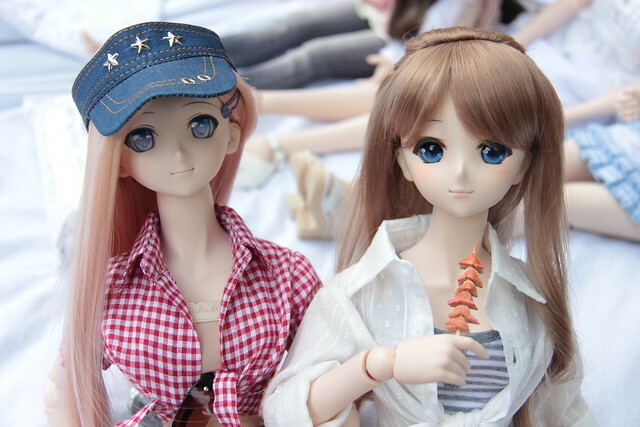 Here are the dolls all ready for a nice afternoon picnic! 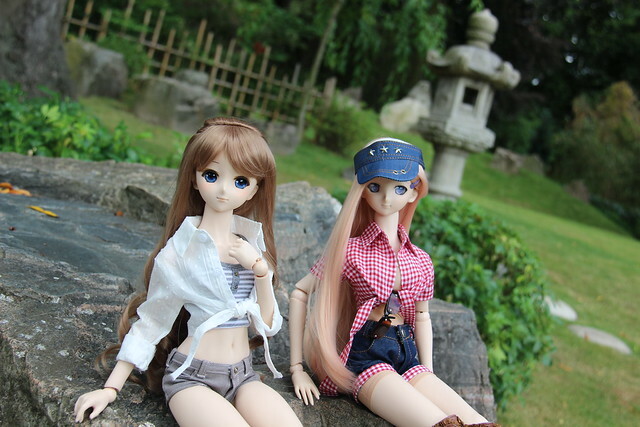 Left to right are Bethykin’s Freya (DD Moe) and Sa-Chan (DD Sakuno), Jezatron’s Kanu Unchou, GabrielVH’s Sakura Matou, my Serena (DD Yuki Morikawa), Beth’s Yuki (DDH-06) and Jez’s Ryomou. 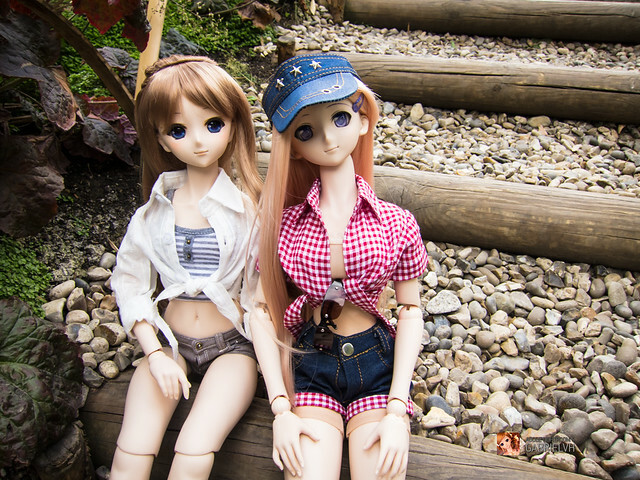 I wanted to bring Serena back to the UK as a belated birthday trip for her, it’s been just over a year since I adopted her into my doll family. I dressed her up on Thursday afternoon and packed her into my doll carrier so imagine my surprise when Gabe dressed Sakura in a coordinating outfit! This was totally unplanned! The garden was full of people relaxing on the grass, a few bridal parties taking wedding photos and in order to keep the garden nicely manicured there were bamboo partitions to show where people weren’t allowed to step on the grass or trample the flowers. There are little stone shrines throughout the garden and artfully placed stones. We had to ask the security staffer if we could place the girls on this big rock to take photos. I think having the big DSLR throws people off since they assume I’m taking photos for commercial use, but I played the part of eccentric tourist and got permission! Yay! 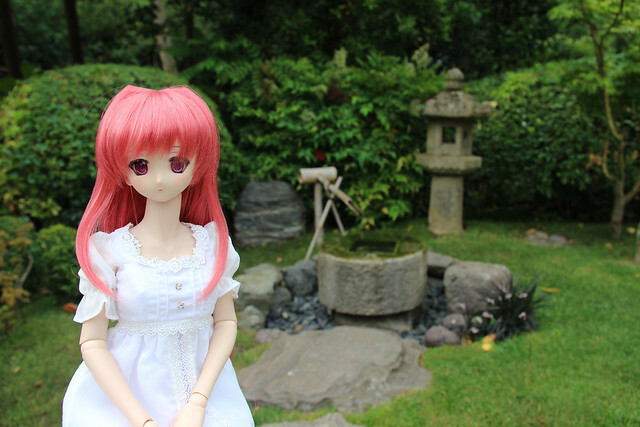 There was also a beautiful little waterfall, which was a popular photo spot for everyone that came into the garden. 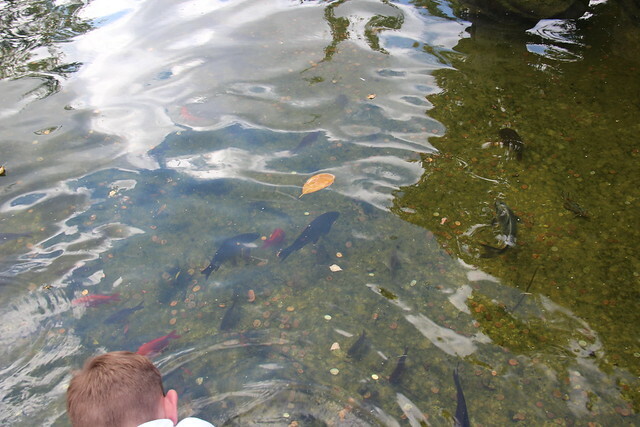 I think you can make out some of the huge koi fish in the pond. There were so many beautiful koi and they were so large! There was this little water fountain that amused me a bit. If any of you are playing ‘Animal Crossing: New Leaf’ and have seen the ‘Deer Scare’ item you’ll understand ^__^” (It has absolutely nothing to do with deers!) Oh and if anyone has the Dream Suite in AC:NL and wants to take a dream visit to my town – my code is: 5900-2200-7411! Sa-chan has such an adorable expression. 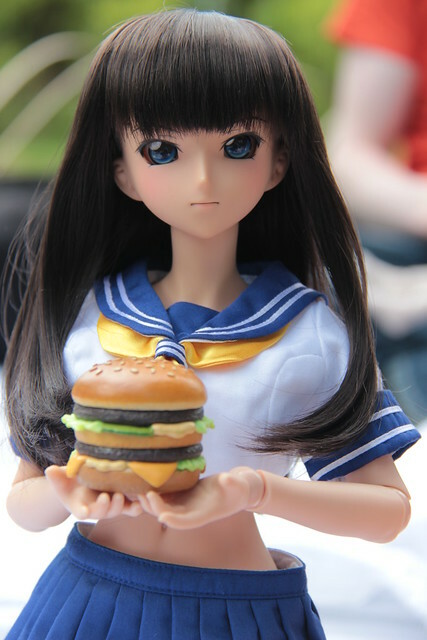 I’m not usually a fan of pouty-mouth sculpts but she’s really quite cute. Time passed too quickly while we were relaxing on the grass, but it was getting late so we packed up and headed into Soho-Chinatown for dinner. After dinner we had to hurry to see Bethykins off and make sure she caught her coach home. We made it just in the nick of time with 1 minute to spare! 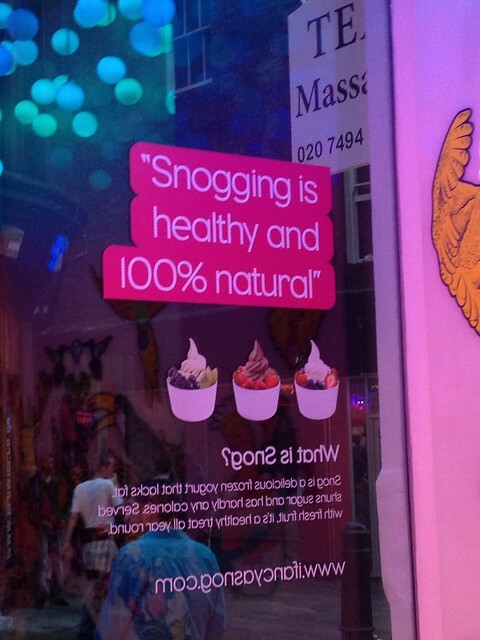 @__@” Left with the guys, our thoughts immediately went to dessert so we went back to Soho for a Snog. 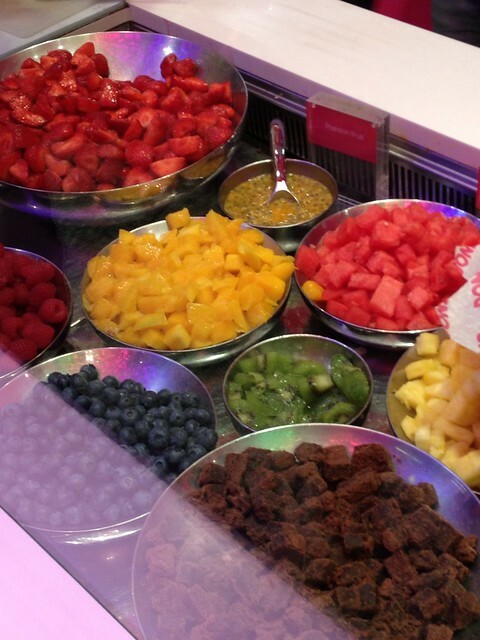 Don’t get any funny ideas: Snog is the name of a chain of frozen yogurt bars where you can choose from a huge array of toppings to go on your fro-yo. To check out the rest of my photos from this meet, pop by this Flickr set. I had a really great time hanging out with everyone, and this was one of the most relaxed days I’ve had in a long time – truly a perfect day. 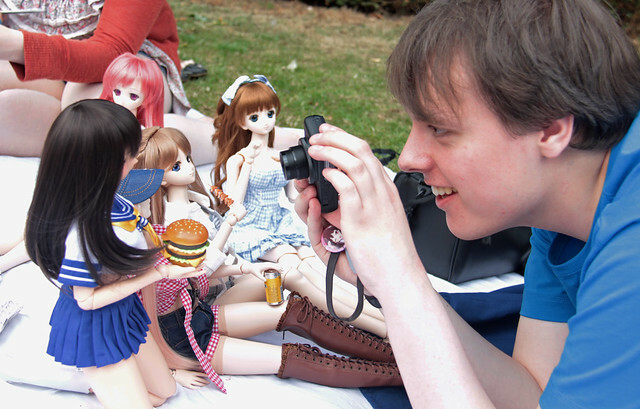 I’m a bit bummed that I won’t be in town for Hyper Japan next weekend, but I’ll be back soon to visit you! 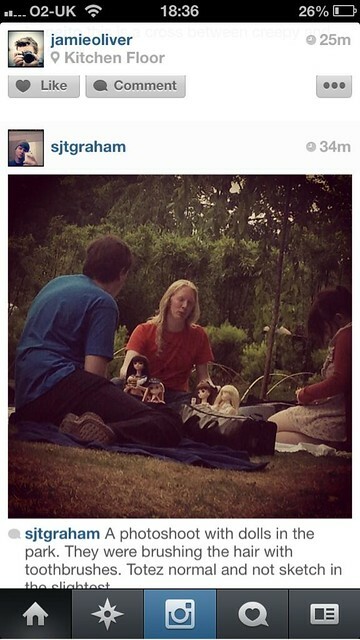 A friend of Beth’s found this on Instagram. None of us were offended by it – in fact we thought it was hilarious, so don’t go trolling this poor person. 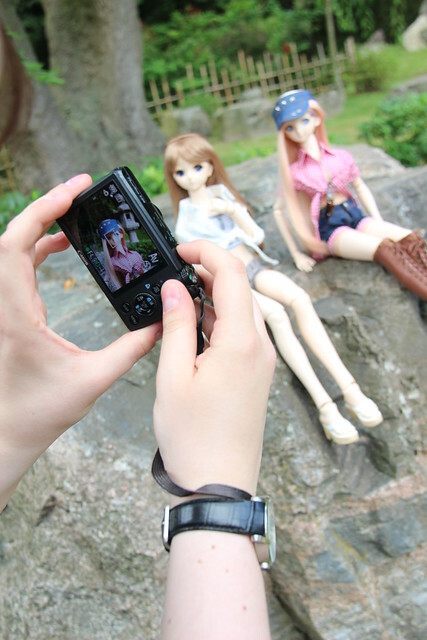 I’ve gotten used to getting creeped at doll meets since people who aren’t in the hobby can think it strange that we take dolls out and photograph them. It doesn’t bother me when people take photos – it’s nice when they ask first, but we live in a society where people just take photos of everything and post them immediately on social media networks, so there’s very little social grace anymore. What’s very rare is to come across a creeper photo later on! 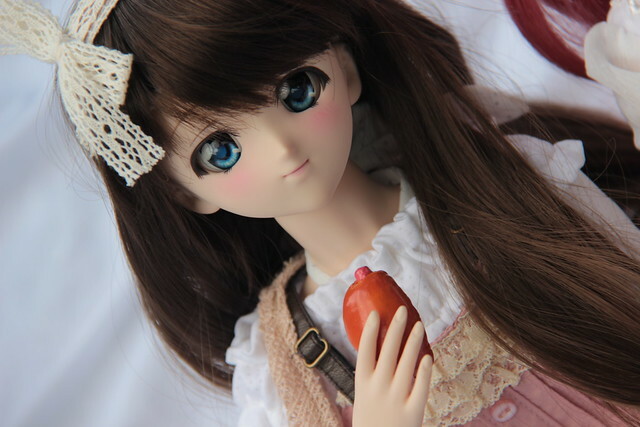 This entry was posted in Doll Meetup, Dollfie Dream and tagged Dollfie Dream, London, meetup, Sakura Matou, Serena, Yuki Morikawa by archangeli. Bookmark the permalink.